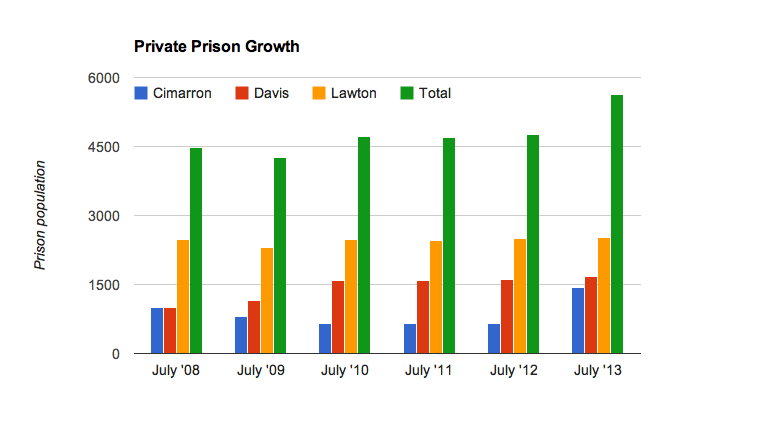 How the number of Oklahoma inmates in private prisons has grown over the years. At the July Oklahoma Department of Corrections board meeting, officials announced the approval of moving 310 more Oklahoma inmates to the Cimarron Correctional Facility, a private prison in Cushing. The move was just the latest in a recent shift of state inmates to three private prisons in Oklahoma. Since July 2008, the number of Oklahoma inmates in private prisons has grown by 32 percent, from 4,264 to 5,625 in July 2013. The three private prisons are Cimarron and Davis Correctional Facility in Holdenville, run by Corrections Corporation of America, and Lawton Correctional Facility, operated by the Geo Group. A fourth private prison, North Fork Correctional Facility in Sayre, houses California inmates and is also owned by Corrections Corporation of America. Two other private prisons, Great Plains Correctional Facility in Hinton and Diamondback Correctional Facility in Watonga, are closed. With state prisons at 98 percent capacity, and with the Oklahoma prison population expected to grow in coming years, it’s possible the private prison population will continue to grow.